Of all the teachings of Christianity, the doctrine of hell is easily the most troubling, so much so that in recent years the church has been quietly tucking it away. Rarely mentioned anymore in the pulpit, it has faded through disuse among evangelicals and been attacked by liberal theologians. Hell is no longer only the target of those outside the church. Today, a disturbing number of professing Christians question it as well. Perhaps more than at any other time in history, hell is under fire. The implications of the historic view of hell make the popular alternatives, annihilationism and universalism, seem extremely appealing. But the bottom line is still God’s Word. What does the Old Testament reveal about hell? What does Paul the apostle have to say, or the book of Revelation? 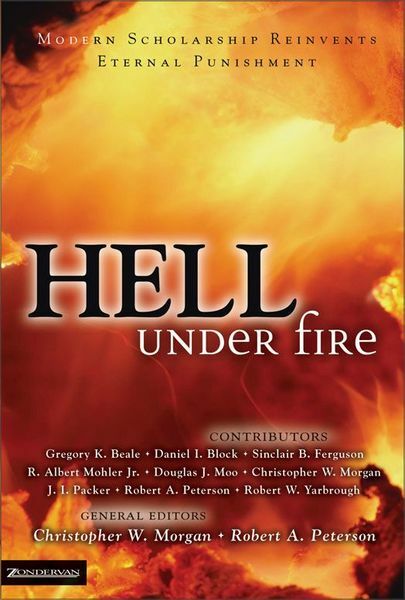 Most important, what does Jesus, the ultimate expression of God’s love, teach us about God’s wrath?Upholding the authority of Scripture, the different authors in Hell Under Fire explore a complex topic from various angles. R. Albert Mohler Jr. provides a historical, theological, and cultural overview of “The Disappearance of Hell.” Christopher Morgan draws on the New Testament to offer three pictures of hell as punishment, destruction, and banishment. J. I. Packer compares universalism with the traditional understanding of hell, Morgan does the same with annihilationism, and Sinclair Ferguson considers how the reality of hell ought to influence preaching. These examples offer some idea of this volume’s scope and thoroughness.Hell may be under fire, but its own flames cannot be quenched by popular opinion. This book helps us gain a biblical perspective on what hell is and why we cannot afford to ignore it. And it offers us a better understanding of the One who longs for all people to escape judgment and obtain eternal life through Jesus Christ.